Here is the weekly review of the top performing Wolverines alumni, who are currently playing in pro basketball. #1. Nemanja Milosevic (6'9''-PF-87, played in 2005-06, plays pro in Hungary) led his Hungarian team Szolnok to a victory against the closely-ranked Prishtina (1-4) 89-76 in the FIBA Europe Cup last Wednesday. He scored 14 points, grabbed 8 boards, passed 5 assists and added 3 steals in 29 minutes. Szolnoki Olajbanyasz KK (1-4) is placed third in group I. Milosevic's team will play only one more game in the FIBA Europe Cup Second Stage. And that game will be critical. 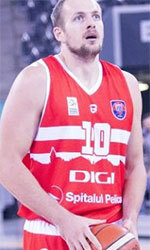 Milosevic has relatively good stats this year 15.0ppg, 6.3rpg, 3.0apg and 1.7spg in three games he played so far. #2. Drew Brandon (6'4''-G-92, played in 2011-13, plays in Poland) could not help AZS Koszalin (4-14) in their last game on Sunday. Despite his very good performance AZS Koszalin was edged 85-82 at home by the higher-ranked GTK (#11). Brandon was the top scorer with 19 points. He also added 8 boards, dished 8 assists and stole 4 balls. It's Brandon's first season with the team. Brandon has relatively good stats this year 12.9ppg, 6.1rpg, 5.1apg and 1.4spg. #3. Jordan Ngatai (6'5''-F-93, played in 2012-13, currently in Australia) was not able to help New Zealand Breakers in their game against United (16-8) in the Australian NBL. It was not Ngatai's best game last Friday. He recorded only 2 points in 3 minutes on the court. New Zealand Breakers were badly defeated 107-87 on the road by the leading United. There are only three games left until the end of the Regular Season. So now every game is very crucial. It's Ngatai's first season with the team. This year Ngatai averages 0.6ppg in 11 games. #4. Aragad Abramian (6'0''-PG, graduated '17, plays pro in Kazakhstan) was not able to secure a victory for Barsy Atyrau (1-7) in their game against Academik Plovdiv (7-3) in the Balkan League. He recorded 5 points. Barsy Atyrau was defeated 81-67 in Plovdiv by the higher-ranked Academik (#3). It was Barsy Atyrau's third consecutive loss in a row. There are only four games left until the end of the Balkan League Regular Season. So now every game will be important. This season Abramian averages 9.4ppg, 3.2rpg, 1.6apg and 1.2spg. He is a naturalized Armenian.